You’ve heard me complain over and over again about our living room. I’ve done so much to the space yet it’s never felt like it’s come together. Recent projects include modernizing the corner built-in and trying to pick out a great neutral paint color. 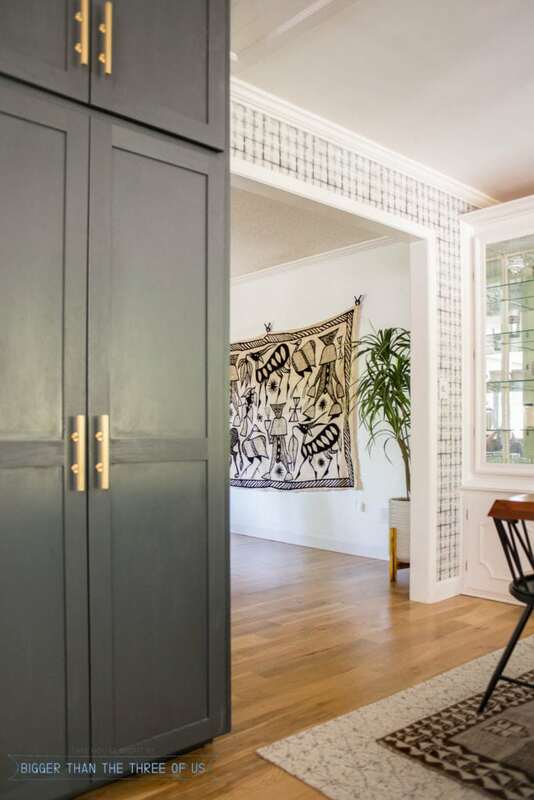 Both of those projects helped me inch closer to where I’d like to be in the space but it wasn’t until I found the inspiration piece, the Korhogo Textile Art, that I really felt like I had an amazing plan for the living room. 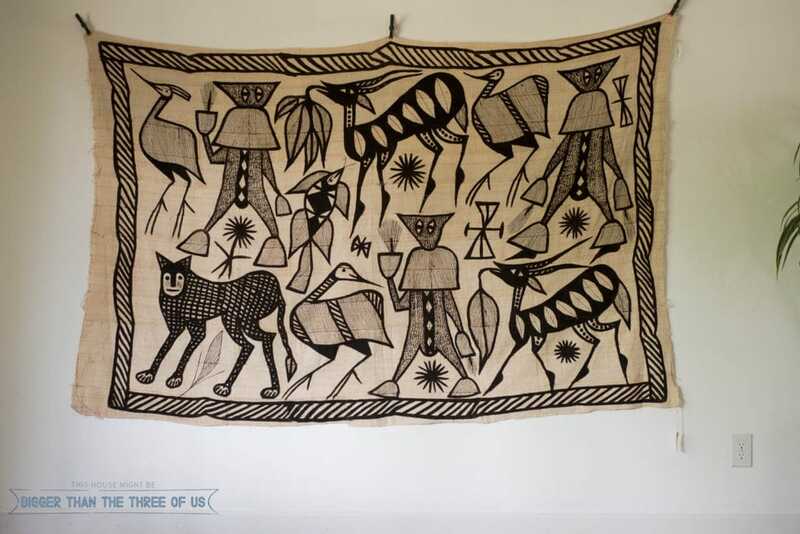 Let’s talk about that Korhogo Textile Art! While watching Instagram Stories a few months ago, I came across @winkwinkstudio sharing a snippet of her living room. My JAW HIT THE FLOOR because of this amazing piece of woven art that she had. I had no idea what it was so I immediately messaged her to find out more. She said that the piece was a Korhogo cloth textile that she had framed. After further research, I found that Korhogo is made a bit like mudcloth but off the Ivory Coast. The pieces that are made are used for clothing and decor. 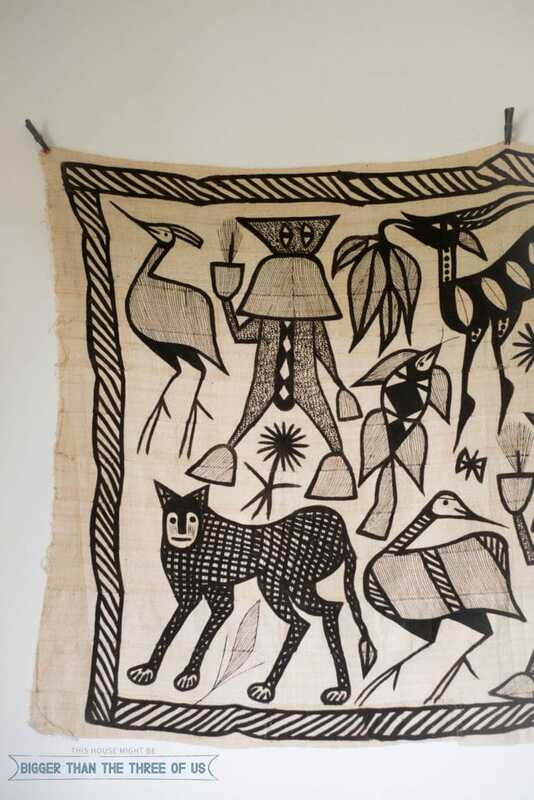 I did a internet search for “Korhogo cloth” and found a few gorgeous pieces. I narrowed down my search to two pieces that I just loved and bought the piece with the better dimensions for my living room. 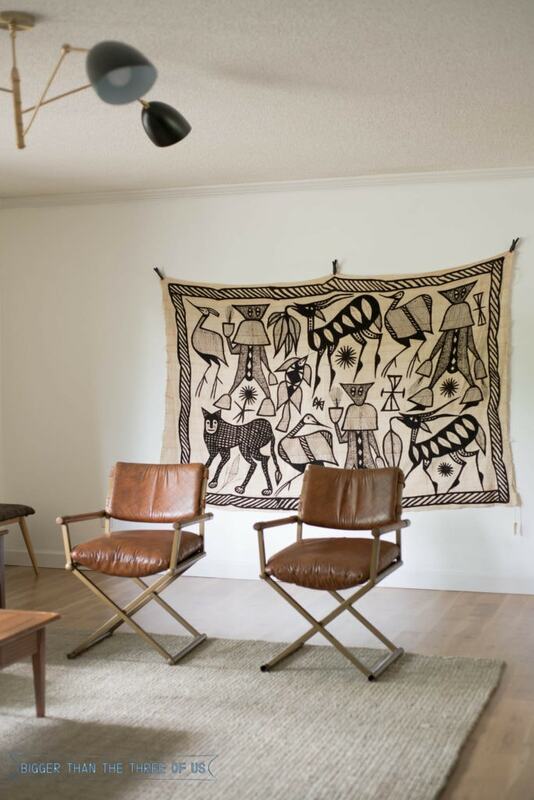 This Korhogo textile is 5’x 7′. It’s HUGE! It’s really the PERFECT size for our living room. I hung it up with clips to see what I thought of it (and to show you guys!) and I am completely smitten with it! It’s just beautiful! So, framing though…framing an oversized piece of art is very expensive. There are quite a few tutorials for DIYing the frame for an oversized artwork but I really want something that looks amazing. Ideally, I’d love to have a glass frame with a stained wood, thin profile around the piece. The problem comes with finding the right size of glass or acrylic. 5 foot is really hard to find. 4 foot is really common. So, when I need 5′ x 7′ and I want to have one seamless panel… well, that’s the tough part. So, framing is still up in the air but I had to share my newest living room addition with you all! Also, for an update about the living room paint color… I was waiting on this piece!! The next month is absolutely insane for us so I doubt painting the space will happen soon. BUT, baby steps in finding the absolute perfect piece of art!